The Greenland Dog is one of the world’s oldest breeds, having been used by the Eskimos since ancient times as both a hunting and a transportation dog. Dogs selected for breeding were always evaluated for their strength, sturdiness and endurance, but an attractive appearance was also kept in mind. 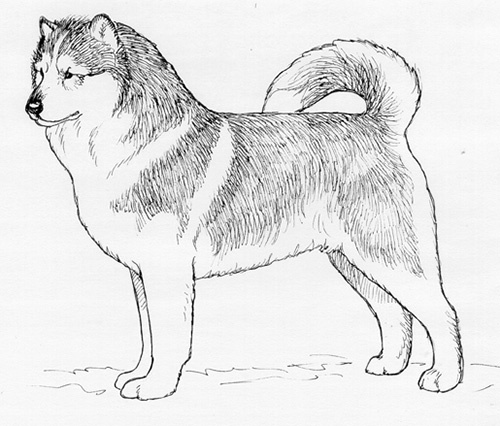 The Greenland Dog was recognized by the United Kennel Club January 1, 1996. A very strong, polar type Spitz breed, built for endurance and strenuous work as a sledge dog in difficult Arctic conditions. Some variation in size is allowable as long as working ability and balance are not compromised. The predominant temperament qualities of the Greenland Dog are energy, mental strength and boldness. He is a tireless sled dog and while friendly to people, he is not particularly attached to any one person and not suitable as a guard dog. The breed has a strong instinct for hunting polar bear and seal. The skull is slightly arched and broadest between the ears. The stop is definite, but not abrupt. Wedge shaped, broad at the base and tapering towards the nose, but never pointed. The nasal bridge is straight and broad from the stop to the nose. The lips are thin and tight. Large and dark, corresponding to the color of the coat. In red or gold dogs, the nose is often liver. Snow nose is not a fault. Dark eyes are preferred, but eyes that match lighter colored coats are acceptable. The eyes are set obliquely and are neither sunken nor protruding. Lids are tight fitting. The expression is frank and bold. Disqualifications: Eyes of different colors. Wall eyes. Rather small and triangular in shape, with rounded tips. The ears are carried firmly erect, and are very mobile and expressive. Serious Fault: Ears not carried firmly erect. The shoulder blades are moderately laid back. The upper arm is straight and strong, somewhat longer than the shoulder blade. Perfectly straight, with strong muscles and heavy bone. The elbows fit close to the body, but have free action. The carpal joint is strong and flexible, and the pastern is strong and elastic and only slightly sloping. The body is strong and rather compact, just slightly longer that the height at the withers. The chest is deep and broad, but the ribs are not barrel shaped. The back is straight, and the topline is level or just slightly sloping. The loin is broad, and the croup is slightly sloping. The belly follows the natural line of the brisket, but a slight tuck up is allowed. The hindquarters are moderately angulated and very muscular. Perfectly straight when seen from behind. The bone is powerful and the thighs are muscular. The hock is broad and strong with moderate angulation. Rather large, powerful and rounded, with strong nails and pads. Set on high, thick and bushy. Carried in a curve or lightly curled over the back. Double, with a dense, straight, coarse outer coat and a soft undercoat. No curl or wave. On the head and legs, the hair is rather short; on the body it is longer and more generous. The coat is long on the tail, giving it a bushy appearance. Serious Fault: Long, soft coat. Height for males is 23.5 inches and upwards. For females, it is 21.5 inches and upwards. An efficient, harmonious, fluid and tireless trot is essential to a sledge dog. In the ring, the breed should be shown on a loose lead at a moderate trot to display good reach and drive. The breed does not single track, but will tend to converge toward a center line when speed is increased.